Hazard Analysis and Critical Control Points (HACCP) is a systematic preventative approach to food safety that addresses physical, chemical and biological hazards as a means of prevention rather than finished product inspection. HACCP is used in the food industry to identify potential food safety hazards, so that key actions, known as Critical Control Points (CCP’s) can be taken to reduce or eliminate the risk of the hazards being realised. The system is used at all stages of food production and preparation processes. Today HACCP is being applied to industries other than food, such as cosmetics and pharmaceuticals. This method, which in effect seeks to plan out unsafe practices, differs from traditional “produce and test” quality assurance methods which are less successful and inappropriate for highly perishable foods. HACCP is based around seven established principles. Principle 1: Conduct a hazard analysis. Plants determine the food safety hazards and identify the preventive measures the plant can apply to control these hazards. A food safety hazard is any biological, chemical, or physical property that may cause a food to be unsafe for human consumption. Principle 2: Identify critical control points. A critical control point (CCP) is a point, step, or procedure in a food process at which control can be applied and, as a result, a food safety hazard can be prevented, eliminated, or reduced to an acceptable level. Principle 3: Establish critical limits for each critical control point. A critical limit is the maximum or minimum value to which a physical, biological, or chemical hazard must be controlled at a critical control point to prevent, eliminate, or reduce to an acceptable level. Principle 4: Establish critical control point monitoring requirements. Monitoring activities are necessary to ensure that the process is under control at each critical control point. In the United States, the FSIS is requiring that each monitoring procedure and its frequency be listed in the HACCP plan. Principle 5: Establish corrective actions. These are actions to be taken when monitoring indicates a deviation from an established critical limit. The final rule requires a plant’s HACCP plan to identify the corrective actions to be taken if a critical limit is not met. Corrective actions are intended to ensure that no product injurious to health or otherwise adulterated as a result of the deviation enters commerce. Principle 6: Establish record keeping procedures. The HACCP regulation requires that all plants maintain certain documents, including its hazard analysis and written HACCP plan, and records documenting the monitoring of critical control points, critical limits, verification activities, and the handling of processing deviations. Principle 7: Establish procedures for verifying the HACCP system is working as intended. Validation ensures that the plans do what they were designed to do; that is, they are successful in ensuring the production of safe product. Plants will be required to validate their own HACCP plans. FSIS will not approve HACCP plans in advance, but will review them for conformance with the final rule. Verification ensures the HACCP plan is adequate, that is, working as intended. Verification procedures may include such activities as review of HACCP plans, CCP records, critical limits and microbial sampling and analysis. FSIS is requiring that the HACCP plan include verification tasks to be performed by plant personnel. Verification tasks would also be performed by FSIS inspectors. Both FSIS and industry will undertake microbial testing as one of several verification activities. the occurrence of the identified food safety hazard. This flow diagram is representative of HACCP for the food industry; the HACCP program can be adapted for other industries as well. The impetus behind modern HACCP programs first began as a natural extension of Good Manufacturing Practices (GMPs) that food companies had been using as a part of their normal operations. A system was needed that enabled the production of safe, nutritional products for use by NASA starting in the late 1950’s to feed future astronauts who would be separated from medical care for extended periods of time. Without medical intervention, an astronaut sickened by foodborne illness would prove a very large liability and could possibly result in the failure of entire missions. Food products could not be recalled or replaced while in space. Beginning in 1959, the Pillsbury company embarked on work with NASA to further develop a process stemming from ideas employed in engineering systems development know as Failure Mode & Effect Analysis (FMEA). Through the thorough analysis of production processes and identification of microbial hazards that were known to occur in the production establishment, Pillsbury and NASA identified the critical points in the process at which these hazards were likely introduced into product and therefore should be controlled. 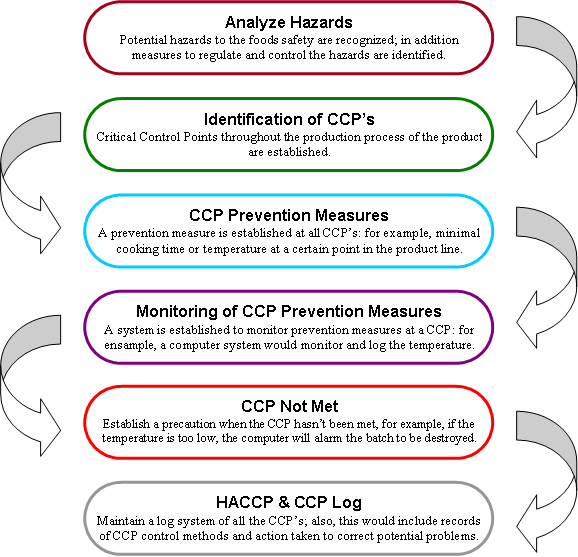 The establishment of critical limits of specific mechanical or test parameters for control at those points, the validation of these prescribed steps by scientifically verifiable results, and the development of record keeping by which the processing establishment and the regulatory authority could monitor how well process control was working all culminated in what today is known as HACCP. In this way, an expensive or time consuming testing procedure is not required to guarantee the safety of each piece of food leaving an assembly line, but rather the entire process has been seamlessly integrated as a series of validated steps. In 1971 the HACCP approach was presented at the first American National Conference for Food Protection. 1973 saw the US FDA apply HACCP to Low Acid Canned Foods Regulations, although if you read those regulations carefully, you will note that they never actually mention HACCP. From 1988 to the present day, HACCP principles have been promoted and incorporated into food safety legislation in many countries around the world. Beginning in 1996, the United States Department of Agriculture (USDA) established a detailed Pathogen Reduction / Hazard Analysis of Critical Control Point (PR/HACCP) program under the Food Safety and Inspection Service (FSIS) to regulate the production of raw meat products by large scale facilities. There is currently no HACCP requirement in the US for food processors such as supermarket deli or butcher departments that purchase from certified producers. The European Union introduced new food hygiene regulations on 1-January-2006 that requires all food businesses within the EU, except primary producers, to operate food safety management procedures based on HACCP principles. Significant flexibility has been included to allow small businesses to comply. HACCP systems are not readily applicable to food businesses like retail caterers and the flexibility allows alternatives to HACCP that achieve the same outcome of safe food being produced. The U.K. Food Standards Agency has produced an adapted simplified version of HACCP for small caterers and retailers called ‘Safer Food Better Business’ (SFBB) that uses this flexibility and is an example of how quality systems and HACCP principles can be creatively adapted for small businesses and different situations. http://www.bluebobble.com for more information. This entry was posted in Proses Produksi MDI. Bookmark the permalink.